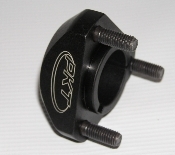 Precision Karting Technologies 30mm long Kid Kart or Cadet Rear Wheel hubs, perfect balance of length and light weight. great to free up the kart for the high grip tracks. price is for one hub. order qty. of two for the pair. choose Hubs in 25mm, 30mm and 1 1/4" axle sizes.